The 1,640-foot-wide telescope is called FAST (Five-hundred-meter Aperture Spherical Radio Telescope), and it’s almost double the size as the next biggest radio telescope, a similarly shaped contraption in Puerto Rico. 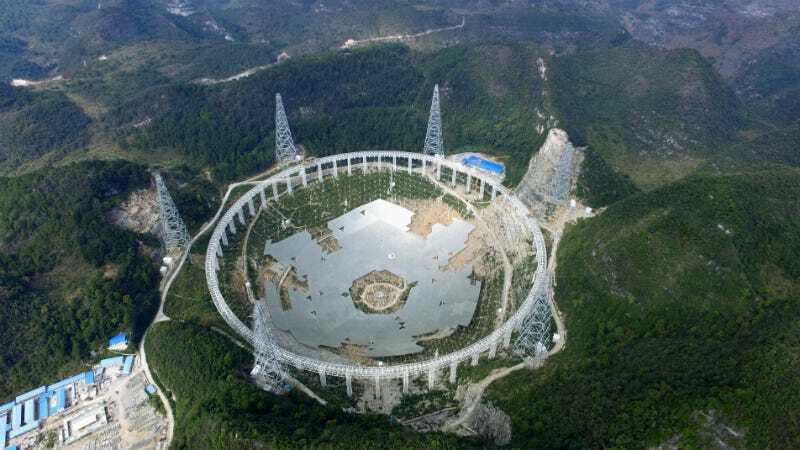 Its 460,000 reflective mirrors will reflect radio signals emitted by the universe onto a 30-ton antenna, which could help us unlock all kinds of galactic secrets, including whether or not we’re truly alone in the universe. The $184 million project is supposed to wrap up in September after five years of construction. And don’t forget that NASA recently discovered the most Earth-like planet ever found and detected gravitational waves for the first time. More powerful and accurate telescopes will undoubtedly open the door to new discoveries. Correction, 5:26 p.m.: The headline originally described FAST as a satellite.